After the defeat of the Republican government in 1939, the thousands of refugees that crammed into the camps of Southern France were living in dreadful conditions. There were two infamous camps: Argelès-sur-Mer and Gurs. Le camp de Gurs was initially built to shelter Basques who arrived after the end of the North campaign in 1937, and there were more than 6,000 of them, but it soon filled with people from all around Republican Spain. Thanks to the endeavours of Iñaki Azpiazu, who would later become the chaplain of the Gernika battalion, the Euzkadi Government intervened and managed to improve the living conditions for the Basques. 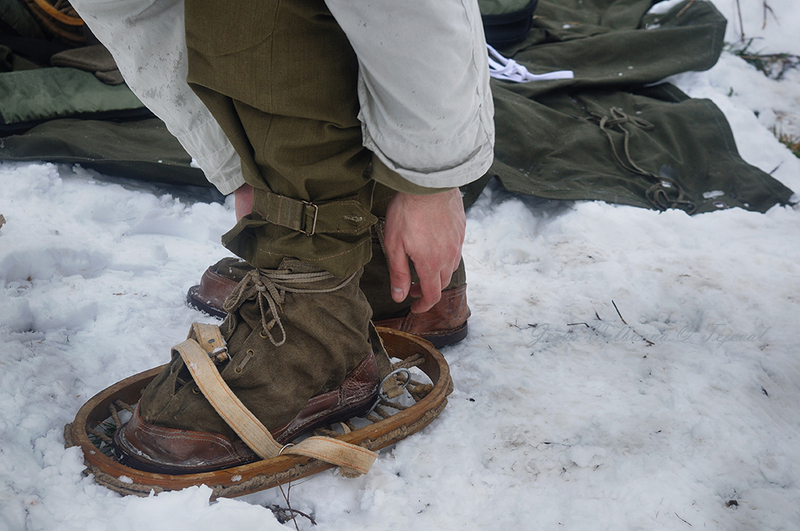 As a result, many of them could leave the camp at the beginning of World War II and take part in it. 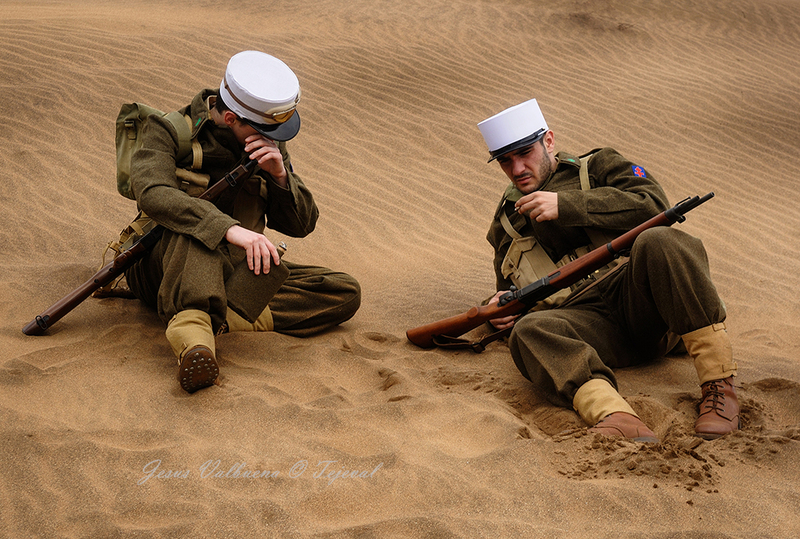 They were really lucky, for those who remained there could not find a job outside those nests of confinement and misery and their only option was to enlist the French army, which was not always so easy. 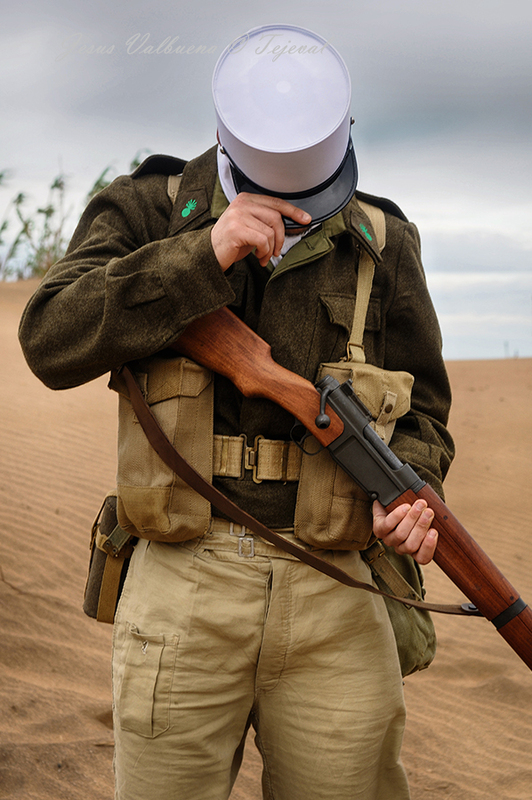 Unlike the Czechs and the Polish, they did not succeed in creating their own Spanish units and, thus, the only way out for many of them was joining the Foreign Working Companies (CTE) or the Foreign Legion. 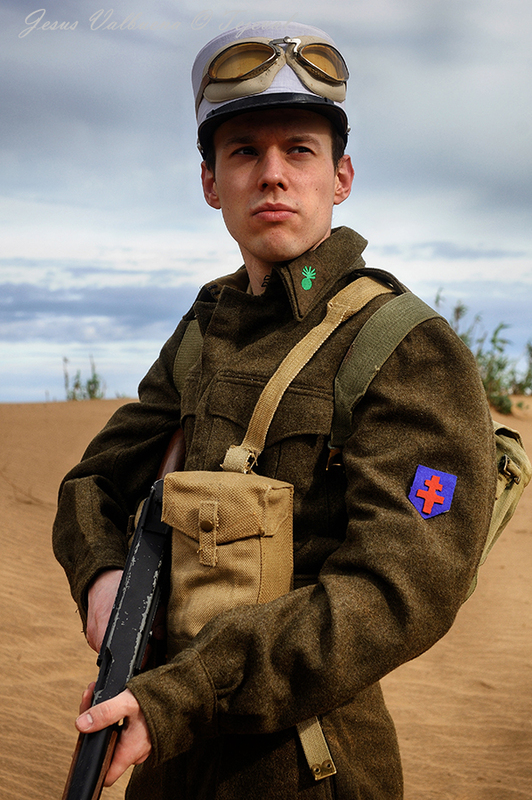 Some chose to enlist the Foreign Legion until the end of war and some others enlisted for a period of 5 years. 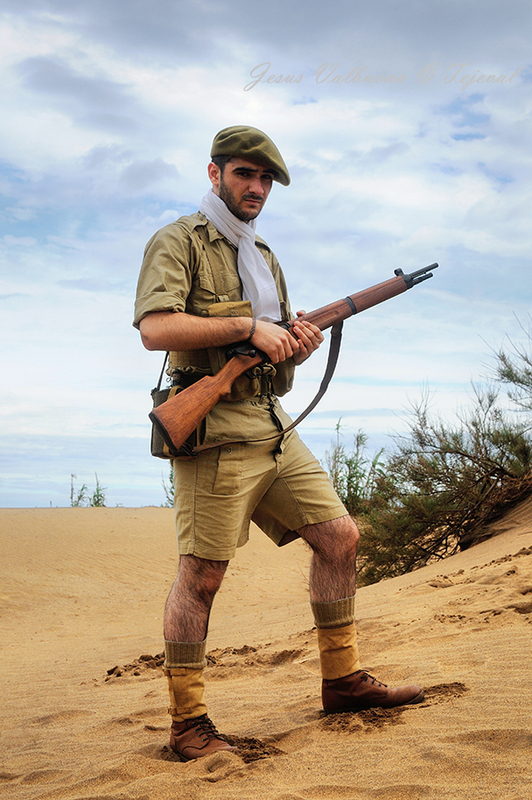 The first of them, who did not actually know that they were enlisted as legionaries, went on to swell the ranks of the Marching Regiment of Foreign Volunteers (RMVE), which ended having about one third of Spanish recruits, while the second of them were sent to the Infantry Regiments of the Foreign Legion that were being created in Africa. The Republican exiled had some reservations about that body and its reputation, which they thought was dubious and contrary to their ideals and, as a result, not many volunteers enlisted. 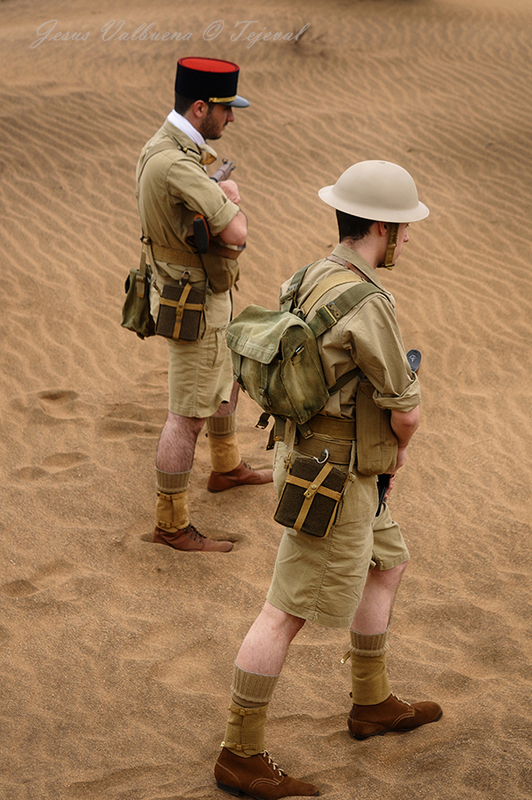 Despite that fact, a total of 3,052 men enlisted the Legion and were sent to Africa in 1939. Among them, there were at least one hundred Basques. 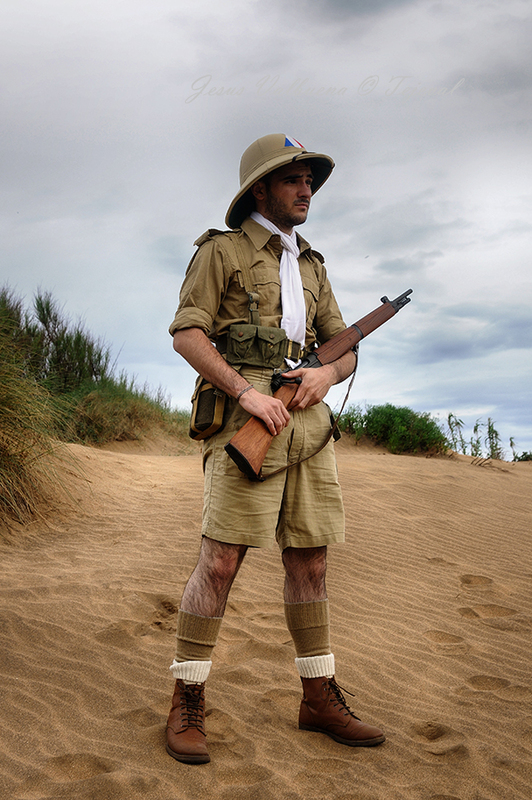 At the beginning of 1940, the Mountain Light Demi-Brigade of the Foreign Legion was constituted in Africa for the purposes of taking part in Finland's campaign. 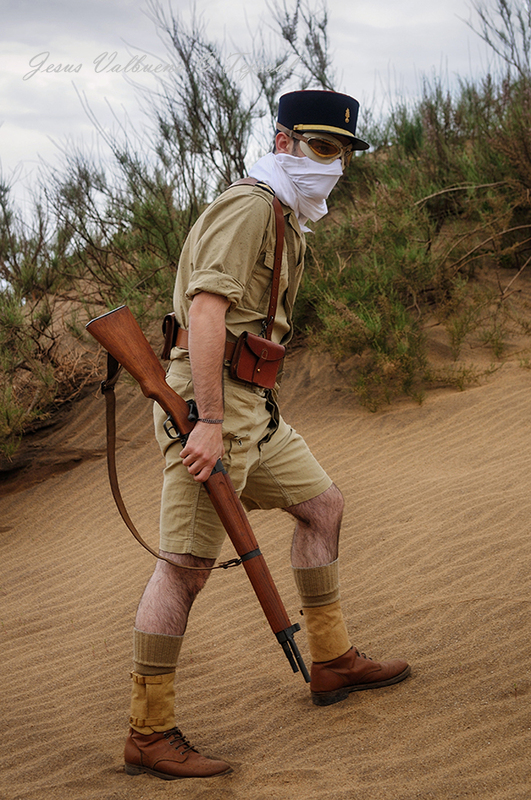 It was formed by two battalions: a first battalion made of volunteers from the 2nd, 3rd and 4th Foreign Infantry Regiments (REI), based on Fez (Morocco), and a second one organised at Sidi-bel-Abbès (Algeria) out of the 1st REI. The name Demi-Brigade refers to a regiment that was finally organised on the base of those two battalions plus a motorised platoon. It consisted of 55 officers, 210 non-commissioned officers and 1984 corporals and soldiers commanded by Lieutenant-Colonel Raoul Magrin-Vernerey 'Monclar', and they left for the metropolis between the 3rd and the 6th of March. The number of Spanish Republican recruits varies depending on the source: from a 25 percent according to André-Paul Comor to a 50 percent according to Eduardo Pons Prades. In any case, there were a high number of them and did indeed leave an imprint on the legionary unit -which was subject to an iron discipline aimed at bringing together criminals, mercenaries and thrill seekers- when they suddenly brought strong solidarity bonds and anti-fascist ideals to it. 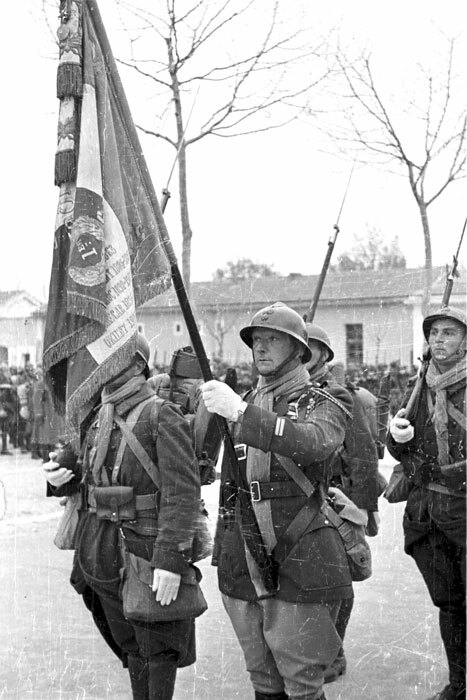 The said bonds and ideals were also shared by many brigade members who had taken part in the war in Spain and had to join the Legion because they could not go back to their own country: Germans, Austrians and Italians, among other. Those shared feelings, which at the beginning were seen with suspicion by officers, were later on used to boost the fighting capacity of troops, and served to build bonds of trust between officers, non-commissioned officers and soldiery never seen before in the Legion. That collective spirit, first raised in Norway and then consolidated through an extraordinary journey halfway across the world, lead the brigade to forge a track record unequalled by any other unit during World War II, and not merely of Free France. 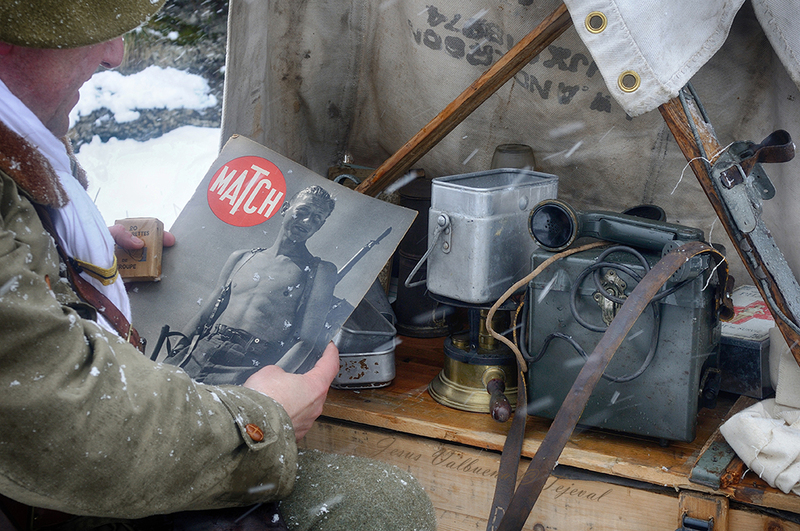 From the cold Arctic to the tropical heat, moving across Europe, Africa and Asia, they took part in the military campaigns in Norway, Gabon, Eritrea, Syria, Libya, Tunisia, Italy, France and Germany. 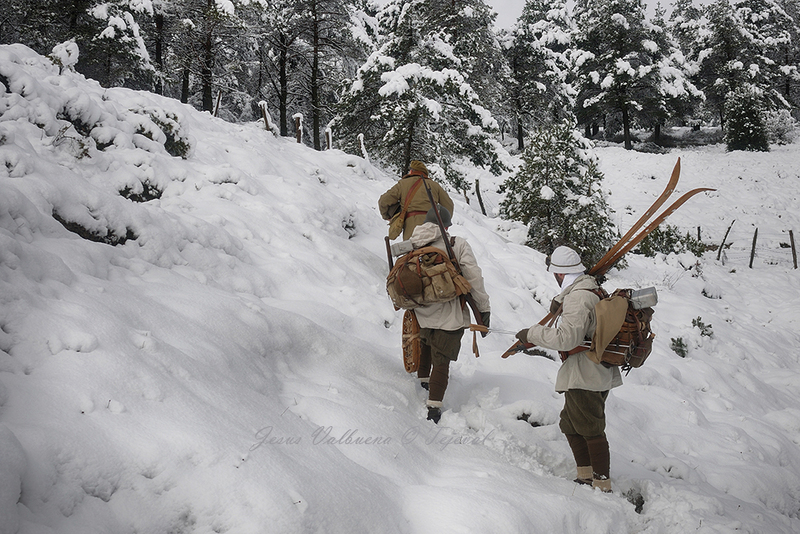 After the end of war, they became again what they were at the beginning of it: a mountain unit, at Authion (Maritime Alps). 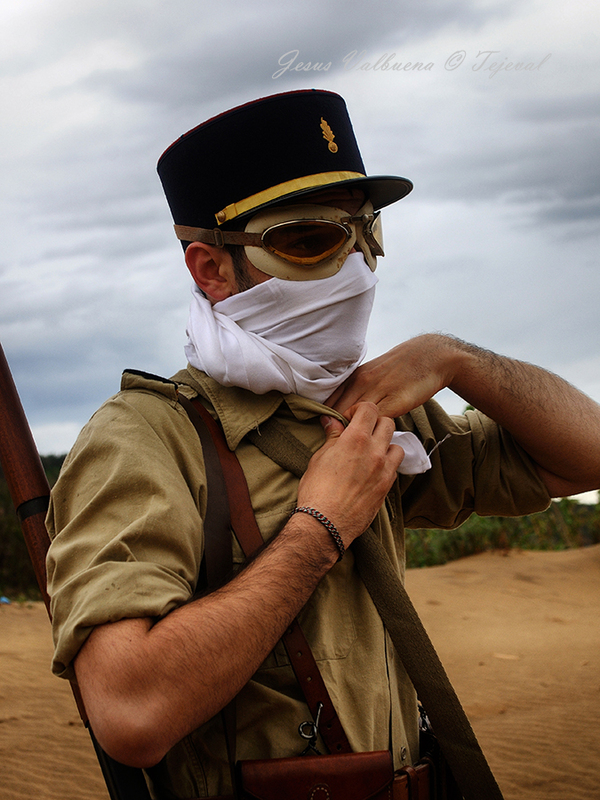 El 1º Régiment Etranger d'Infanterie sale de su cuartel de Sidi-Bel-Abés con destino a la metrópoli para formar la 13ª DBLE (SCA-ECPAD, réference DG-22-454). Aparicio, Arredondo, Arribillaga, Artazcoz, Artola, Bagaza, Basteguieta, Llanos, Maeztu and Huarte. 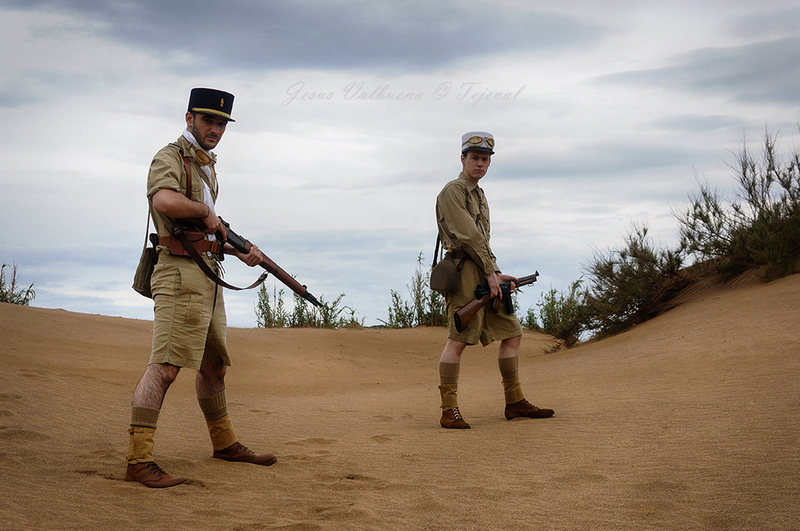 Another special reason for reenacting the 13th Demi-Brigade is that it is currently still part of the French Army as a joint forces unit that has inherited all those traditions. 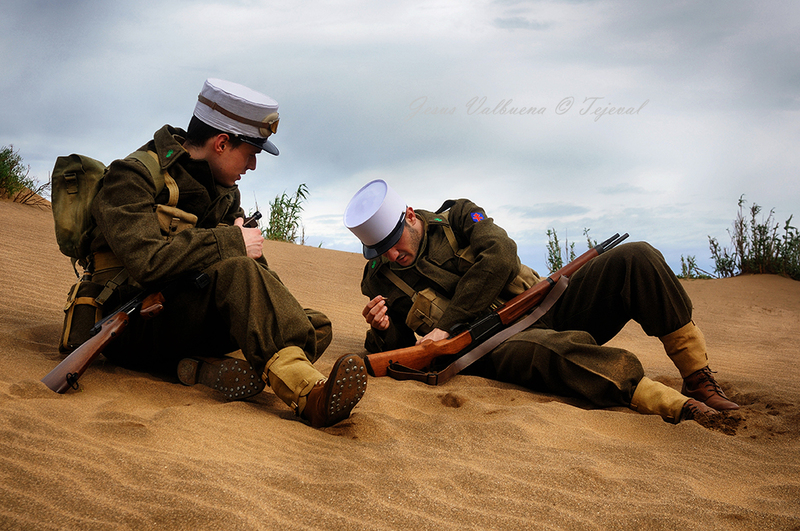 And here is where the concept of respect that we mentioned before plays a special role when reenacting history. 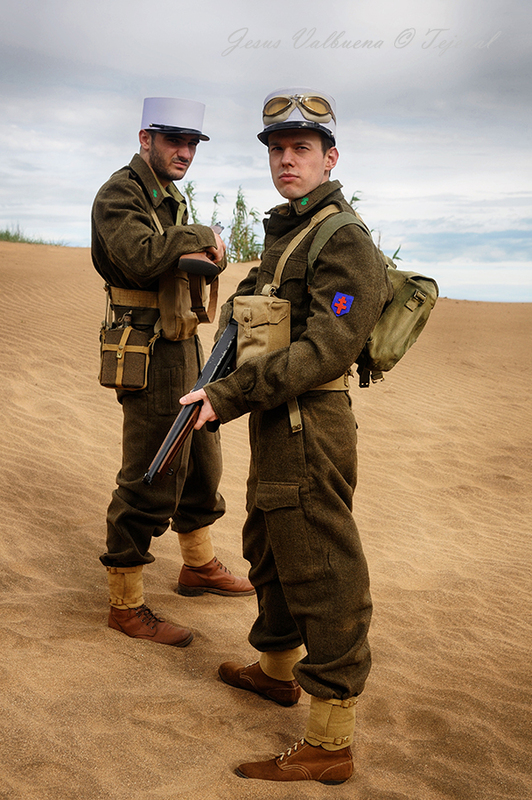 On the other hand, given the wide range of scenarios and their complexity, with all the different uniforms and gear needed to represent five long years of war, we will try to offer the recreator a summary of the most important points, as well as any background information we deem necessary, covering operations superficially in order to determine the chronology of such an extraordinary unit. 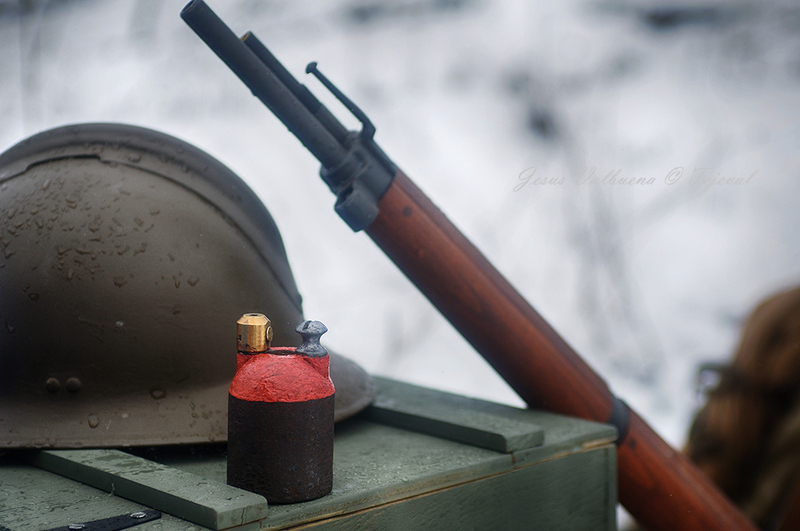 On the 13th of March, Finland and the URSS signed and armistice. Since the Anglo-French intervention was not needed anymore, they started to focus on Norway. 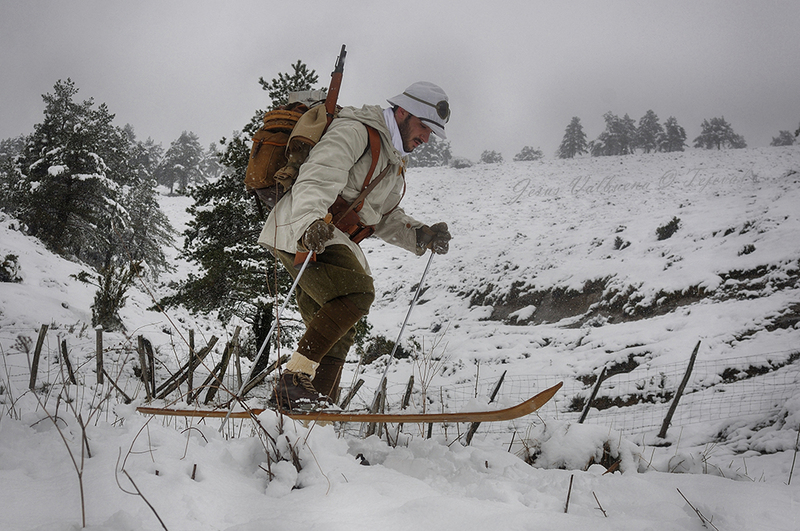 Meanwhile, the legionaries were getting ready at Larzac; they received their gear and began training to become a true mountain unit. 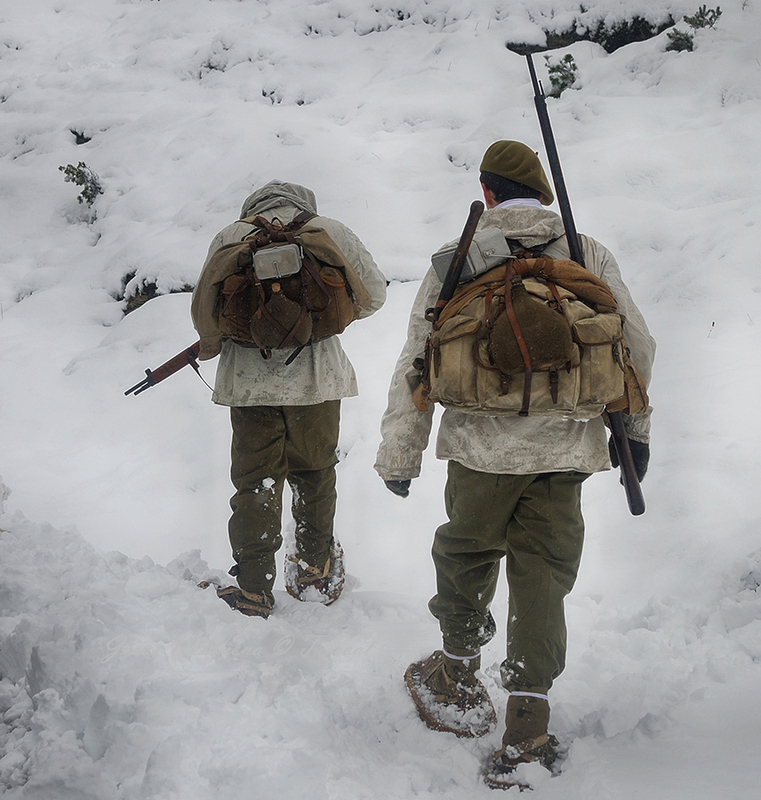 On the 27th of March, they were named as the 13th Foreign Legion Demi-Brigade (13e DBLE) and left for Belley, near Switzerland, to continue training in an environment that was similar to the Scandinavian one. Before their departure, a last reinforcement group arrived, consisting of volunteers who enlisted until the end of war, thus making a total of 2,300 men in the unit. They reached Brest on the 15th of April and left for Norway 8 days later. 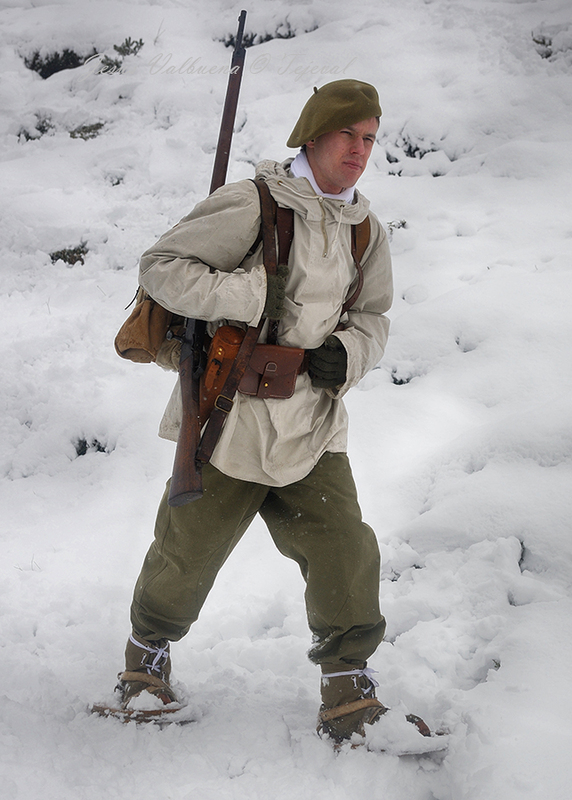 As a way to stress their mountain troops character, the kepi was replaced by the green beret used by the Fortaresse units (stationed in the Maginot line) and they wore woollen socks rolled over the puttees they used to cover their shins between the 1938 golf-trousers and their boots. Some of the specific items they wore were: a veste-bourgeron (a cotton jacket), a kaki biker double-breasted jacket, motorcycle salopettes (pants covers), chaussons neige (snow gaiters), a mouton Canadian coat, a reversible cagoule (raincoat), a pullover, snow goggles, gloves and mittens. All the gear, weighing around 60 kg, was carried inside two rucksacks: one for clothes and personal effects (sac d´allègement), and a Bergam-type rucksack to carry the rolled tent, the spade, the water bottle, picks, etc. 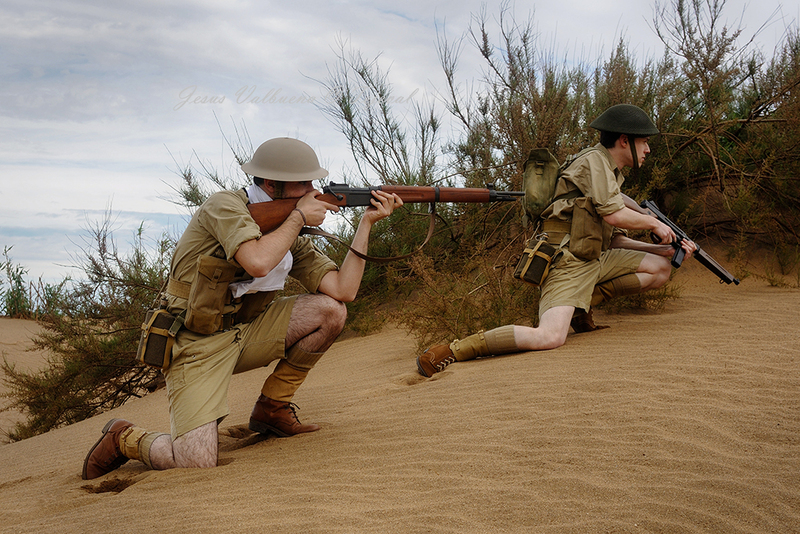 The legionaries, who liked to tie a white chèche around their neck, were given a new MAS 36 rifle, but they still had the old webbing (Lebel 1916 pouches) with the modifications introduced in 1935. 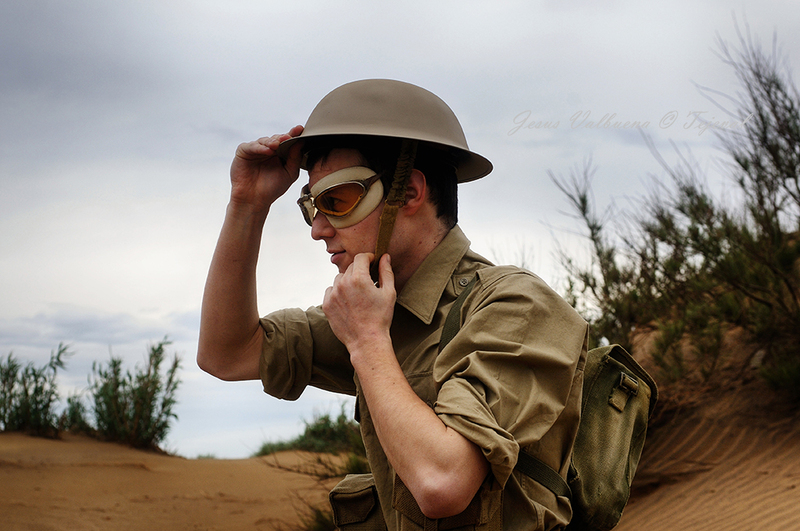 They wore 1926 helmets, although there were still some helmets of the Great War. 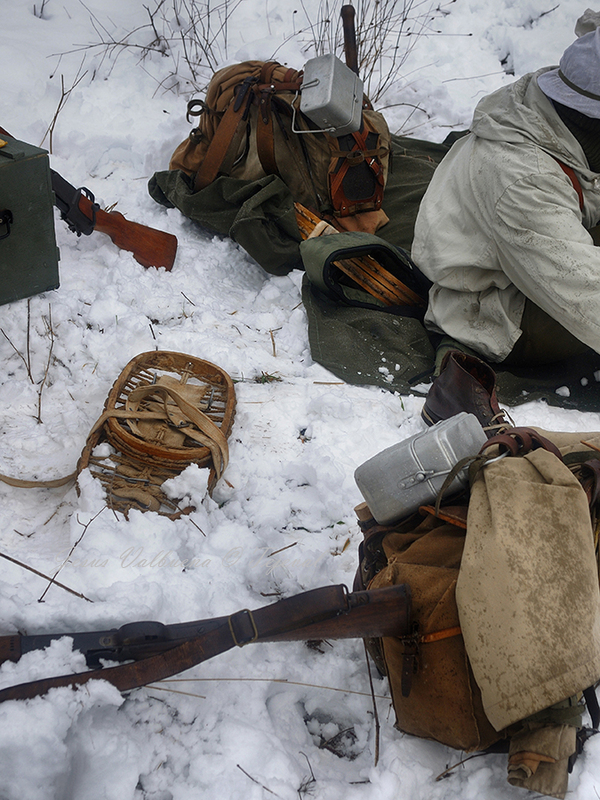 All helmets had a white cover for camouflage in the snow. 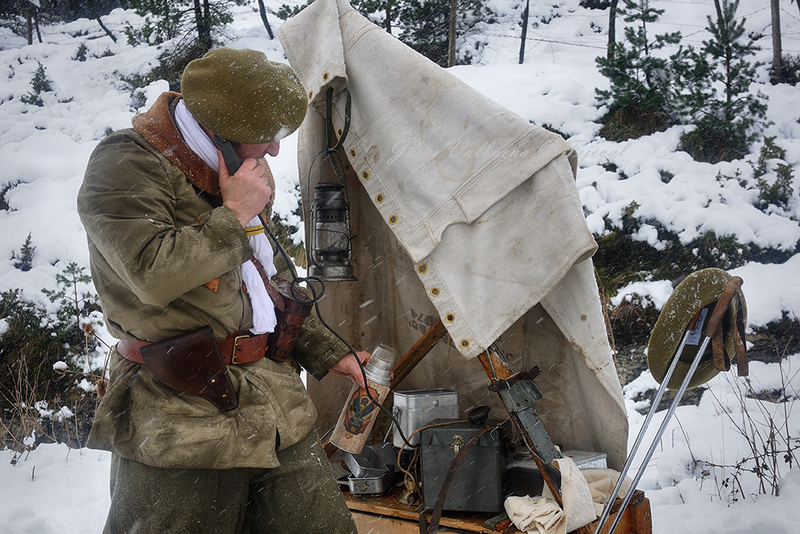 Following the German intervention in Norway on the 9th of April, the Anglo-French command decided to recover the Narvik Harbour and the 13th DBLE put out to sea with the rest of the French expeditionary forces, which included tanks and alpine hunters. 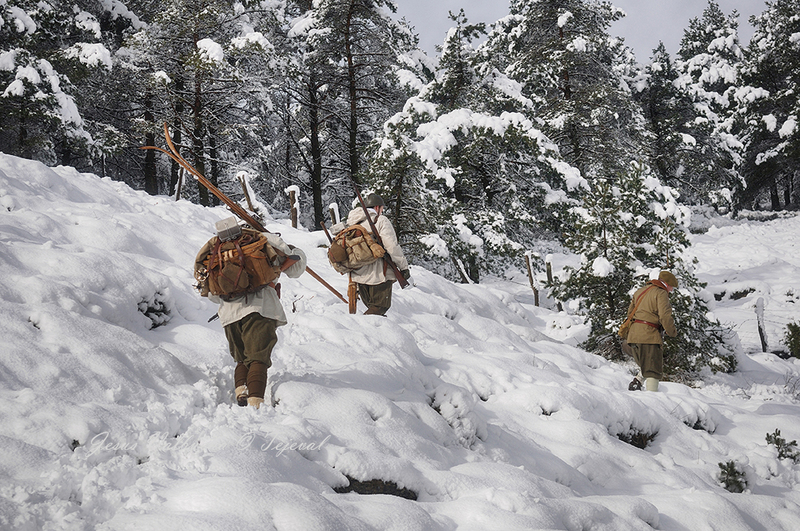 In the first hours of the 13th of May, the legionaries took part in a brave landing to take Bjerkvirk. 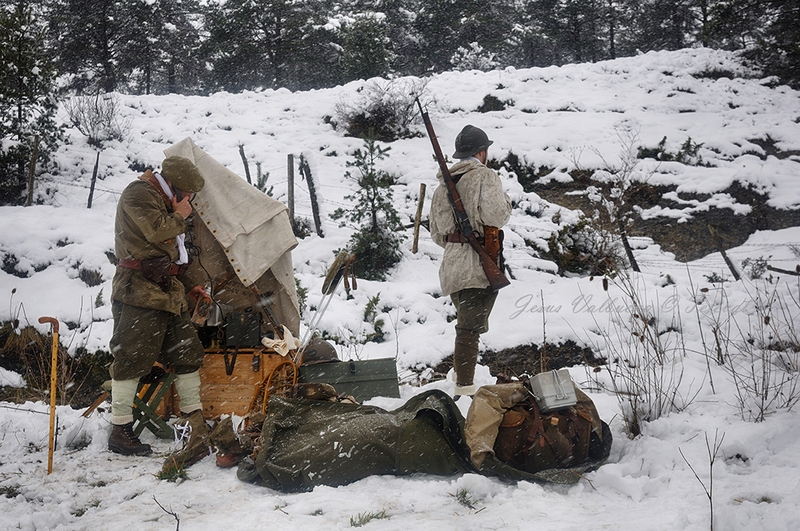 The 1st Battalion had to begin a breakthrough in a first echelon, while the 2nd Battalion successfully made its way towards Elvegaarden. 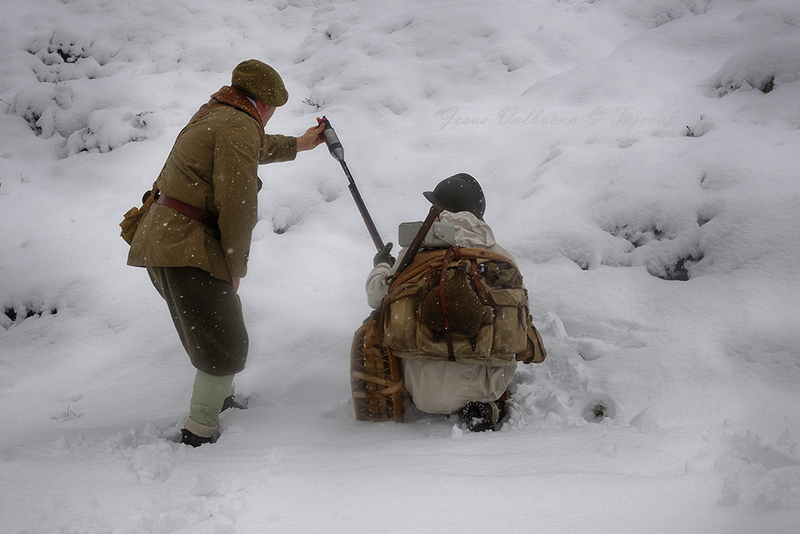 In this combat, a first medal of honour was awarded, received by Spanish soldier Gayoso for the taking of hill 220. Between the 14th and the 17th, all the positions were consolidated under extreme conditions and with almost 24 hours of daylight, a fact that favoured bombings by the Nazi air force. 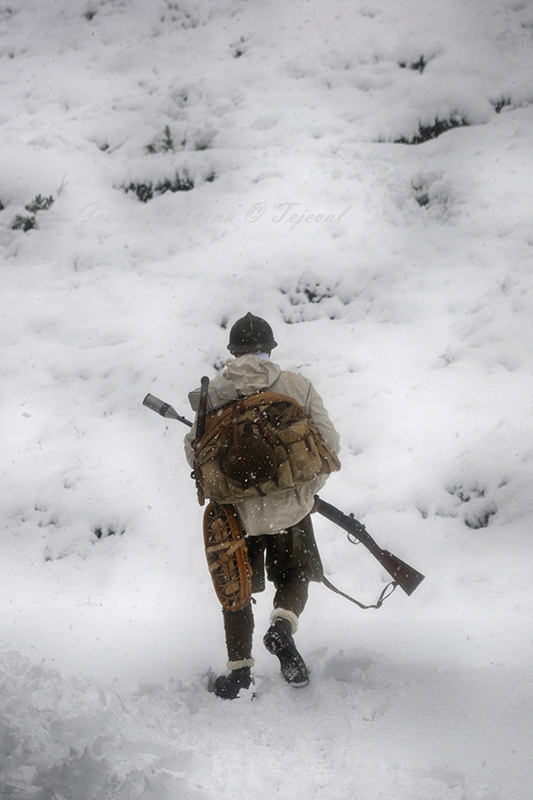 On the 21st of May, the legionaries were relieved in order to take part in the Narvik operations, which started on the 28th. 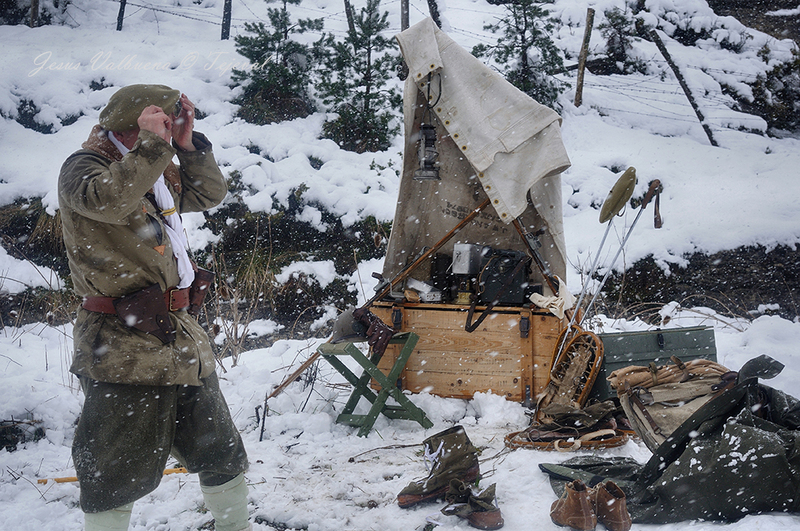 The 13th Demi-Brigade landed on Orneset beach and established a solid bridgehead. The German resistance was very strong and the legionaries fought back bravely, although they had to pay a hefty price in return: only in the 1st battalion, there were 27 soldiers dead and 39 wounded. As to the 2nd battalion, they moved forward with difficulty due to air-raids, but they finally reached their target without suffering many casualties. The French also fought together with Norwegians, Polish and British. 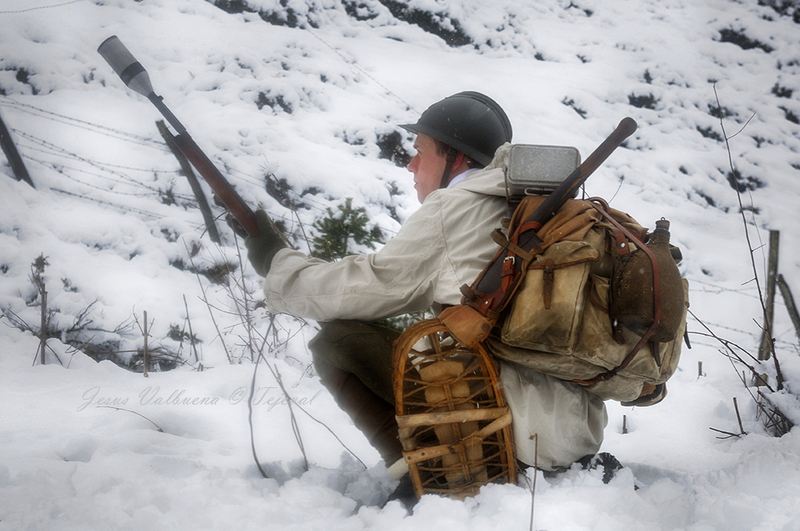 They recovered Narvik and the German troops started fighting a rear guard action. The chase lasted from the 29th of May to the 6th of June, but they did not take much advantage of their success due to the disastrous results of the French campaign. The high command decided to withdraw the expeditionary body. 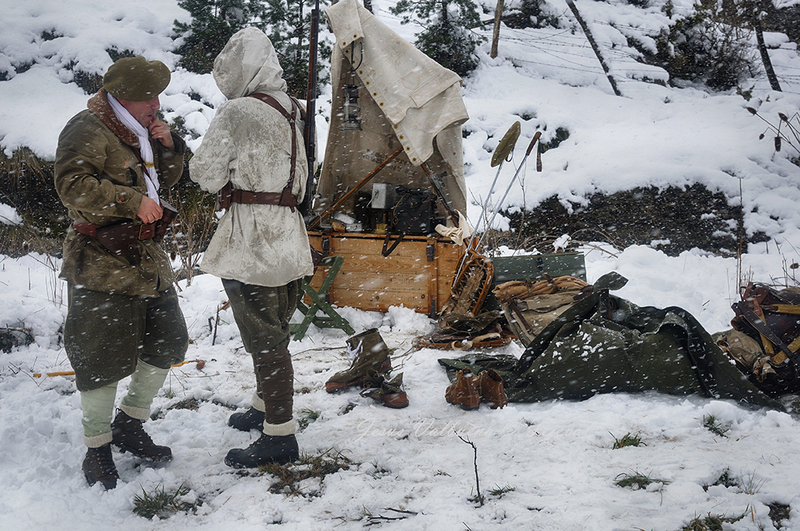 The fights in such frozen lands caused the 13th Demi-Brigade the loss of 7 officers, 5 non-commissioned officers and 55 legionaries, including a high number of Spanish. Brest Harbour, 23rd of April 1940. 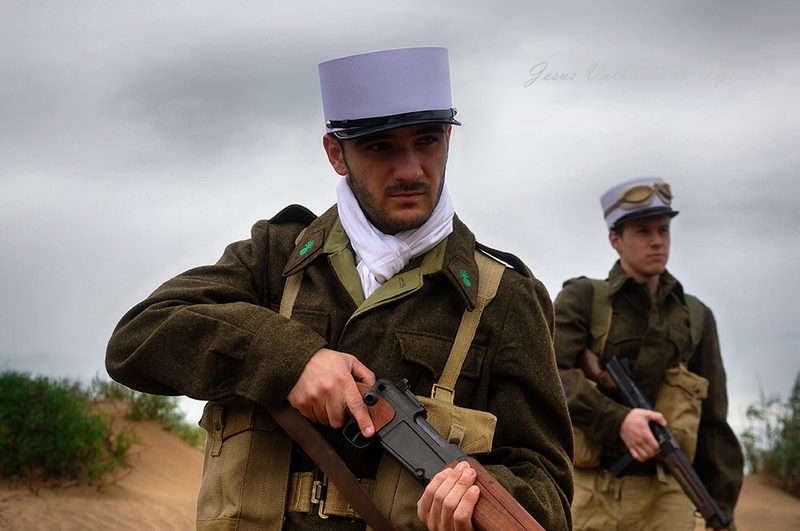 The French expeditionary forces are ready to embark for Norway. François Darlan, Admiral-in-Chief of the French fleet, inspects the 13th DBLE in the presence of Lieutenant Colonel Monclar. Foreground, a skiers section. (http://www.secondeguerre.net/images/articles/evenements/ou/40/norvege.jpg). After a short intervention in the Breton stronghold at the end of the French campaign, where it remained in the second line, and having had a difficult time to avoid the German advance parties, the 13th DBLE finally managed to embark for England at the Brest Harbour. The legionaries were gathered at Trentham Park from the 22nd until the 30th of June, when De Gaulle arrived to call for volunteers to fight for Free France. Then there arose a few problems, some caused by the lack of discipline of some Spanish, others caused by desertions or by the capitulation of France and the consequent repatriation order, which reduced the number of soldiers in the unit by fifty percent. According to André-Paul Comor, "the apparent cohesion of the Spanish in combat, where they displayed a commendable behaviour, could not withstand defeat", although he also admits that the proliferation of rumours concerning the disbandment of the Legion and the use France would give them ended up bewildering a group of men who had chosen it as the best option for escaping the refugee camps. Thus, 300 of them -who had not supported De Gaulle when he asked for volunteers for Free France and were going to embark together with the thousand men who chose to return home after the French capitulation- refused embarking in Avonmouth and mutinied when they learned that they were being taken to Morocco; some of them went to Free France, others to Pioneers Corps of the British Army and a small part followed route to Africa. 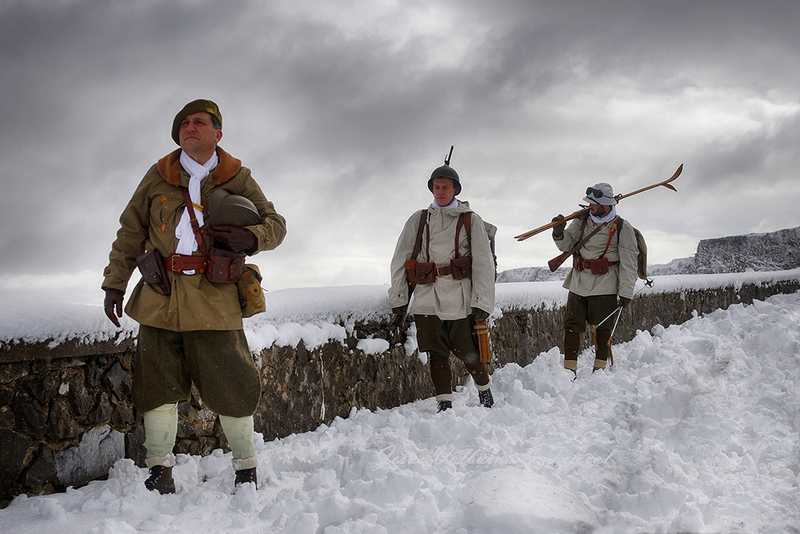 After repatriation of french forces in England in summer 1940, De Gaulle had only 1,994 men left of which, according to Diego Gaspar Celaya, 120 were Spanish Republicans, almost a six percent. 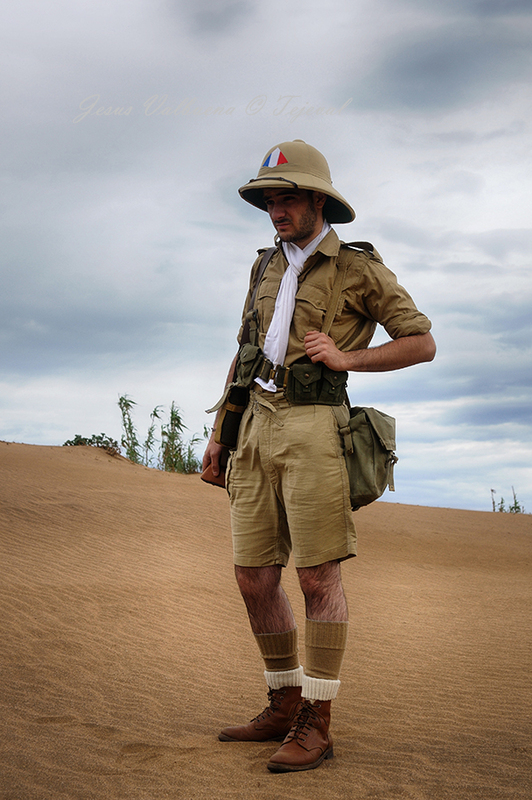 The 13th DBLE was provisionally renamed as the 14th Foreign Legion Demi-Brigade. Colonel Monclar chose 'More Majorum' as the unit's emblem, and he added it to the insignia, plus a Viking ship that symbolises their fight in Scandinavia. 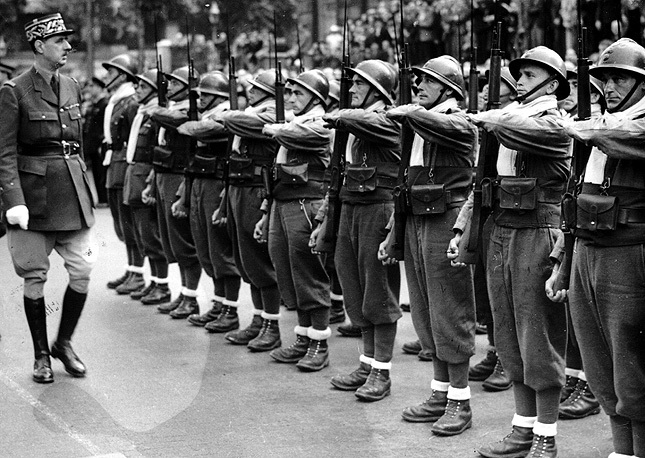 On the 14th of July, General De Gaulle inspected the Free French forces at Whitehall, London. 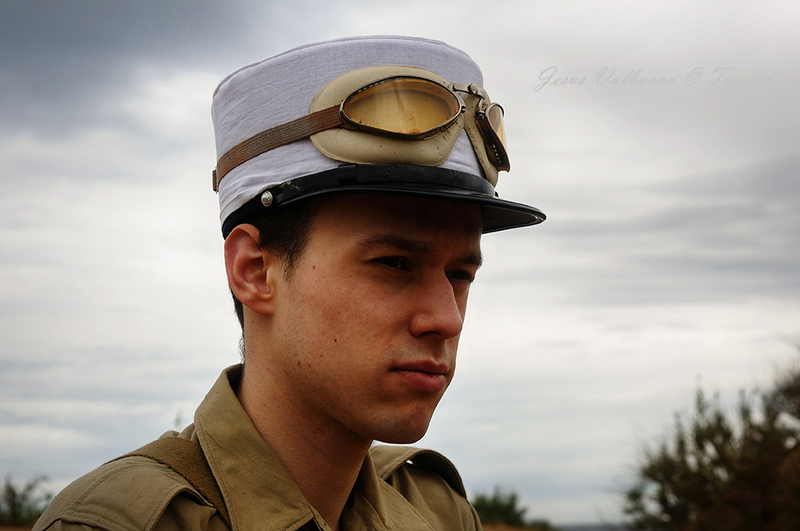 The legionaries honoured him wearing a 1926 Adrian helmet, or an older model, and a veste bourgeron with pattes de col (collar tabs) of the 13th DBLE. 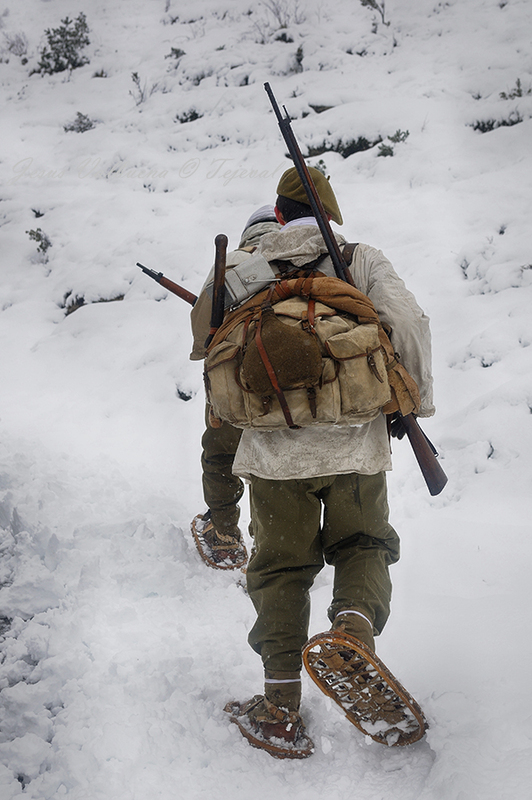 They proudly wore the Legion's white chèche and the traditional blue sash with the old belts, as well as 1938 golf trousers, puttees and 1940 mountain boots showing their socks, rolled in the manner of mountain units. 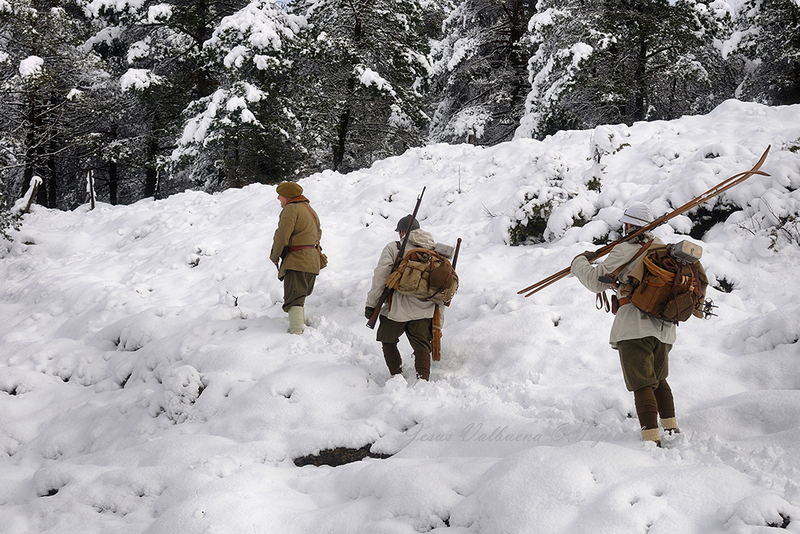 They carried MAS 36 rifles. Whitehall, Londres, 14 de julio de 1940. El general De Gaulle pasa revista a los legionarios de la 13ª DBLE que, junto a otras fuerzas de la Francia Libre, forman ante las autoridades en el aniversario de la toma de La Bastilla, día nacional para los franceses.(https://www.flickr.com/photos/fondation_de_gaulle/9034494626). 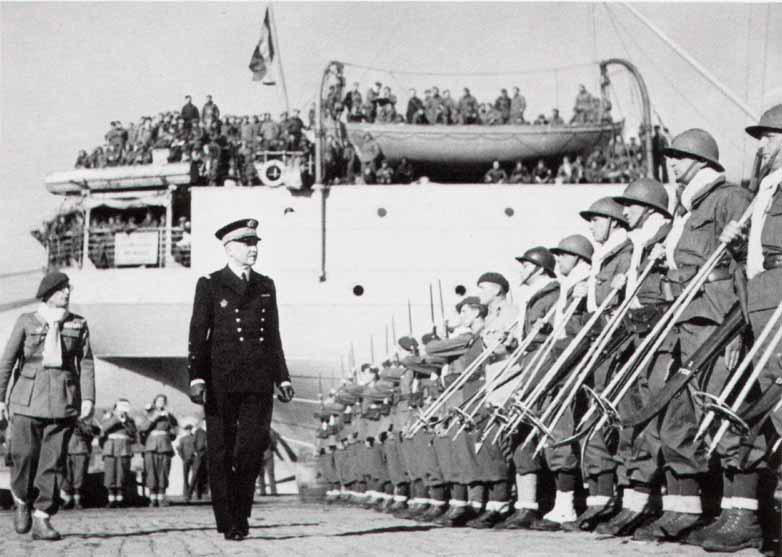 On the 30th of August, De Gaulle's small expeditionary group, formed by the 1,744 men he had managed to gather, left the Liverpool Harbour for Africa escorted by the Royal Navy. The 14th DMBLE was then made of 900 men. After some unsuccessful attempts at landing at Dakar, the expeditionaries began their long colonial journey at the harbour of Duala, in Cameroon, where they were heartily welcomed. Their next stop was Libreville (Gabon), a main access point to the French colonies in Equatorial Africa. After landing in Corisco bay, they went up the N´Tsini river and fought a first battle against the Vichy forces, defeated them and then entered into the colony on the 10th of November. At the end of 1940, when the commitment signed in England between the legionaries and Free France expired, the officers tried to make them renew it but more than 100 men refused and left. The length of the campaign was starting to affect soldiers. It became the 13th DBLE once again, and was commanded by Commander Amilakvari. On the 6th of January 1941, the legionaries left Freetown for Port Sudan. 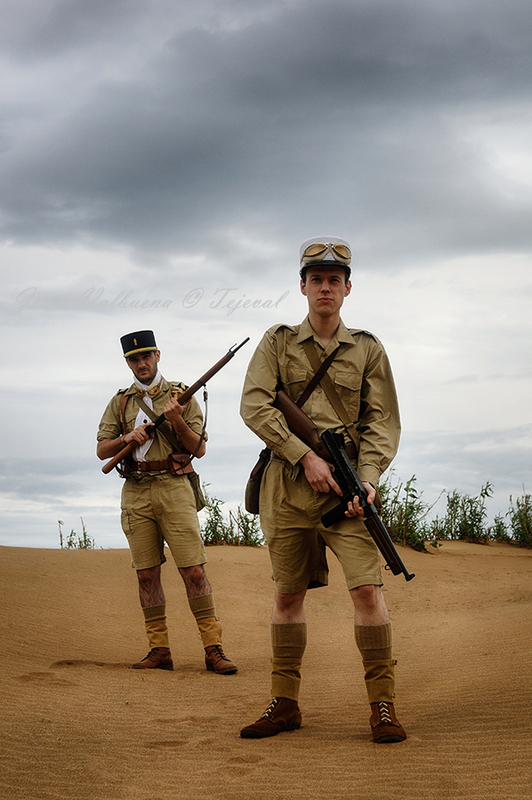 Their goal was to intervene in Eritrea and support the British troops commanded by General Wavel, and to become part of the so called 'Oriental Brigade', which comprised the 3rd Régiment de Marche du Tchad and other French units. There they got into an inhospitable environment with some areas higher than 2,000 m. and narrow valleys with scarce water. The battle of Keren was mainly fought by two Indian divisions and British elements of the Royal Sussex. 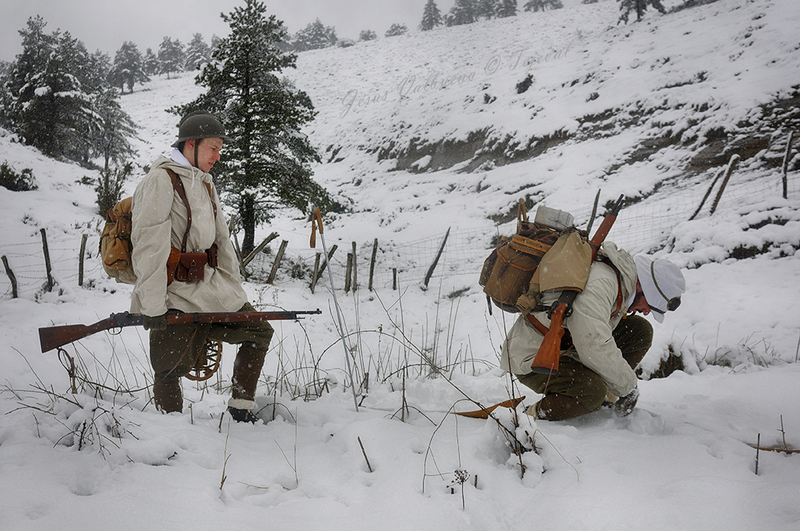 The legionaries fought together with the Italian troops at Mt. Engiahat, and took part in very harsh battles between the 15th and the 27th of March, although they finally reached all their goals. On the 8th of April, they broke into the fortified field of Massawa and took many Italian prisoners, including Rear Admiral Bonetti and Generals Tessitore and Carnimeo. The campaign resulted in 18 dead non-commissioned officers and legionaries and more than 50 wounded. On the 3rd of May, the 13th DBLE left for Egypt. In the spring of 1941, De Gaulle thought that the Middle East territories were directly under the threat of the Axis and their offensive at the Balkans and Africa. The British troops, driven back to the Egyptian border, had to remove from Greece Wilson's small expeditionary body. Despite General Wavell's reservations about opening a fourth front, a military intervention in Syria was finally approved. The British forces in the area were slightly smaller than those at Vichy, but De Gaulle's troops were reinforced with the arrival of soldiers from England and the colonies, and formed the 1st Free French Light Division (1st DLFL), which mainly remained in Palestine. Operations began on the 7th of June. The British 7th Division moved forward and reached Lebanon, while the Free French, supported by the Indian 5th Division, started for Damascus. 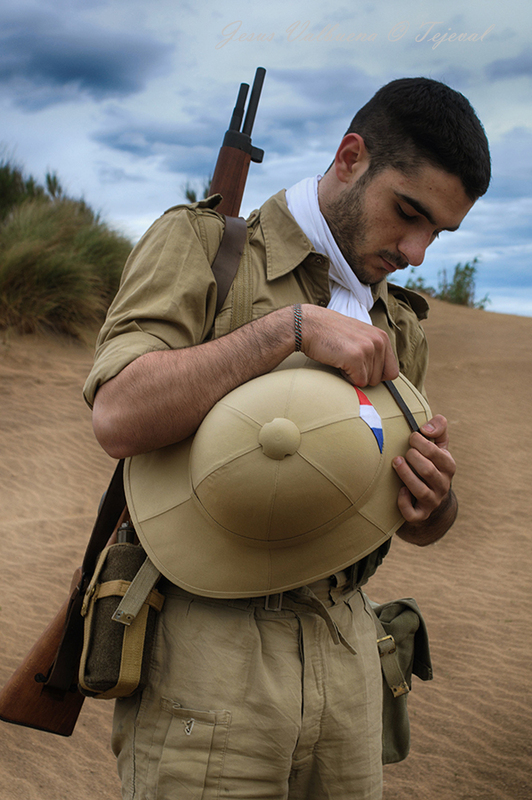 The 13th DBLE would not go into combat until the 17th of June, north of Kissoué. The dreaded -and the only one in its history- battle among legionaries was a brief crash that resulted in one casualty for each side, but Commander Amilakvari refused to fight against their own brothers and stopped the firing, and allowed the withdrawal of the 6th REI legionaries. The offensive of the 1st DFL went on until Damascus was conquered, leading to very violent episodes between the Vichy French and De Gaulle's forces. The 13th DBLE suffered 21 dead and 47 wounded. The next battle was the Battle of Beirut, which lasted until the 12th of July. 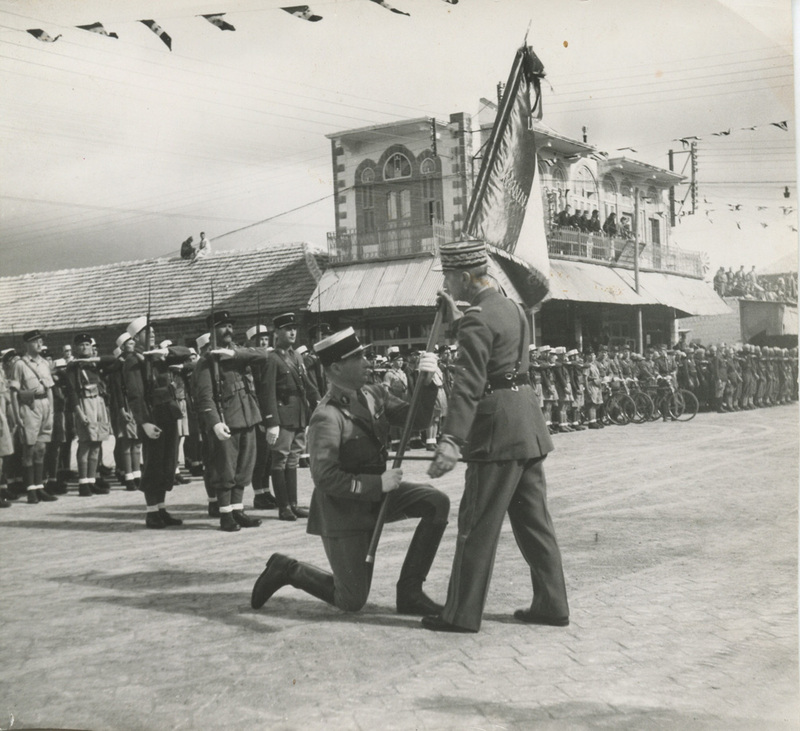 After the recovery of the Middle East territories, 3,000 Vichy soldiers went over to the Free French forces, including 207 legionaries and 28 non-commissioned officers of the 6th REI. 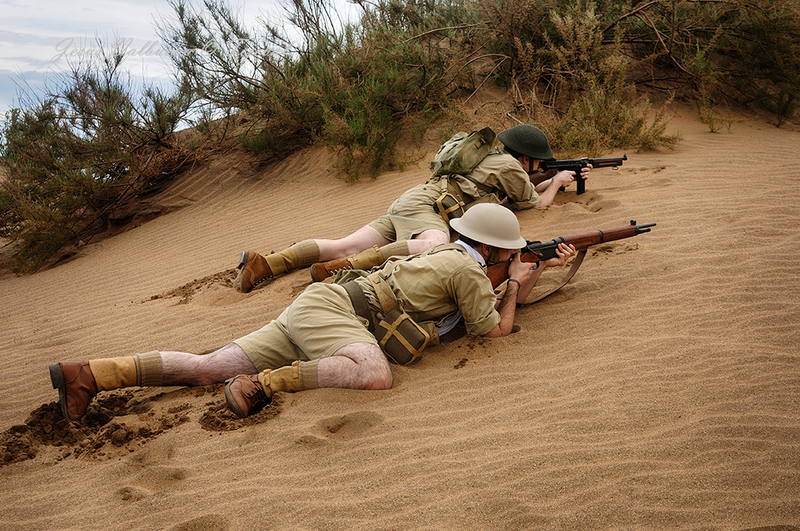 The legionaries fighting at Gabon, Eritrea and Syria were dressed in the sand-coloured, British tropical uniform: a Wolseley pith helmet with the French flag at the front, an aertex pullover with removable epaulets, khaki drill shorts or Bombay Bloomers, brown British boots with khaki socks covering the whole calf and white stockings rolled over them in the manner of french mountain troops. 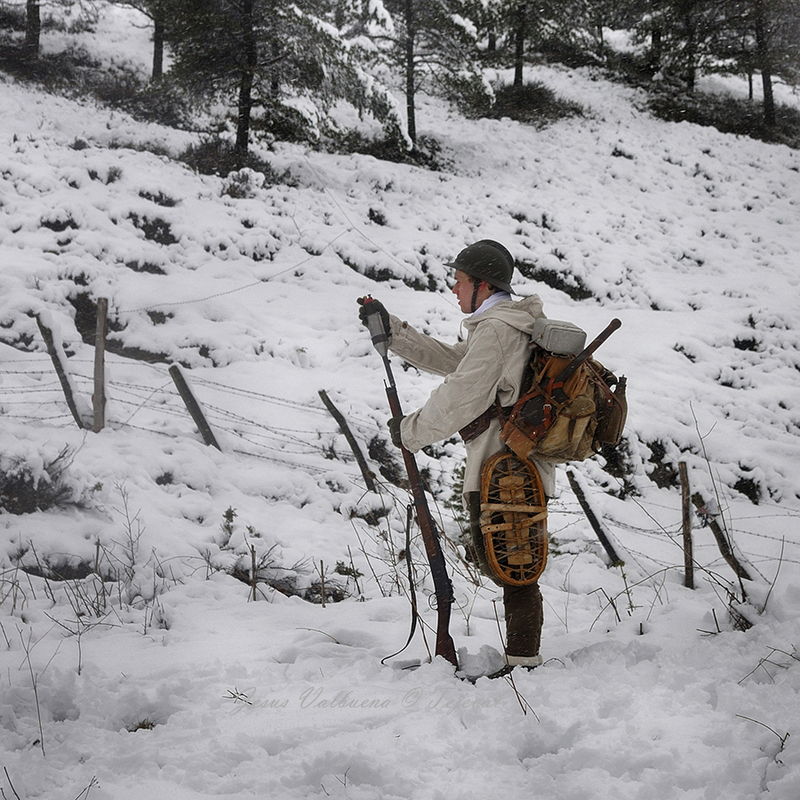 They were equipped with British 37 Pattern Army webbing, but specifically the pouches used for troops other than infantry, so that each legionary could only carry 40 cartridges. 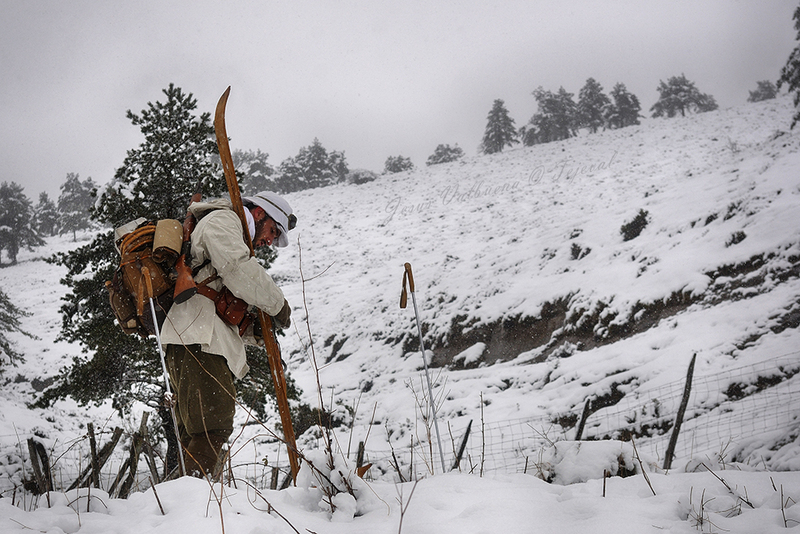 They also carried a water bottle and a haversack hanging from the sides of the belts. The MAS-36 was their service rifle. 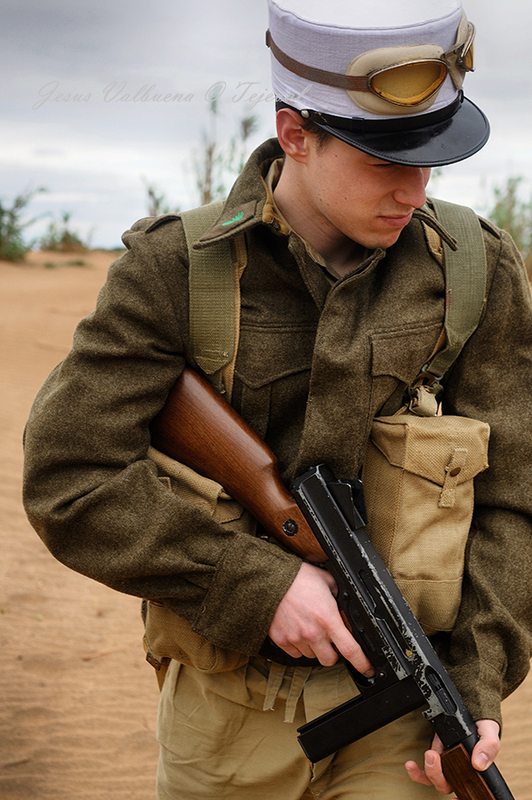 The British uniform included a battledress with a Cross of Lorraine sleeve badge on the left and pattes de col with a seven-flame grenade on the collar. 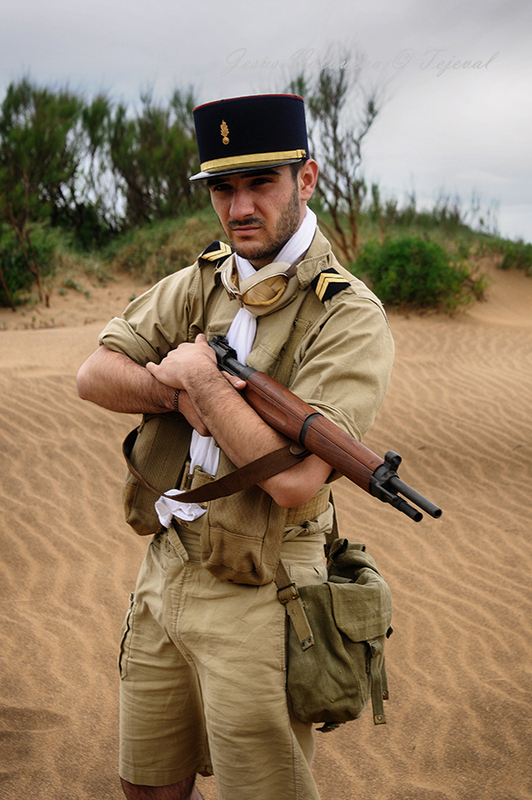 As they appropriated the deposits and arsenals of the Vichy Army, they obtained more and more clothes and equipment of French origin and, thus, their uniform became more mixed, resulting in the characteristic image of the legionaries of the North African campaign after 1942. The North African campaign: Bir Hakeim, El Alamein and Tunisia. In November 1941, the Operation Crusader made the axis forces positioned at Cyrenaica withdraw, but it was an incomplete victory. The enemy still occupied the Halfaya pass. The 1st Free French Brigade was sent there under the command of General Koenig, including four battalions, two of which were legionaries. 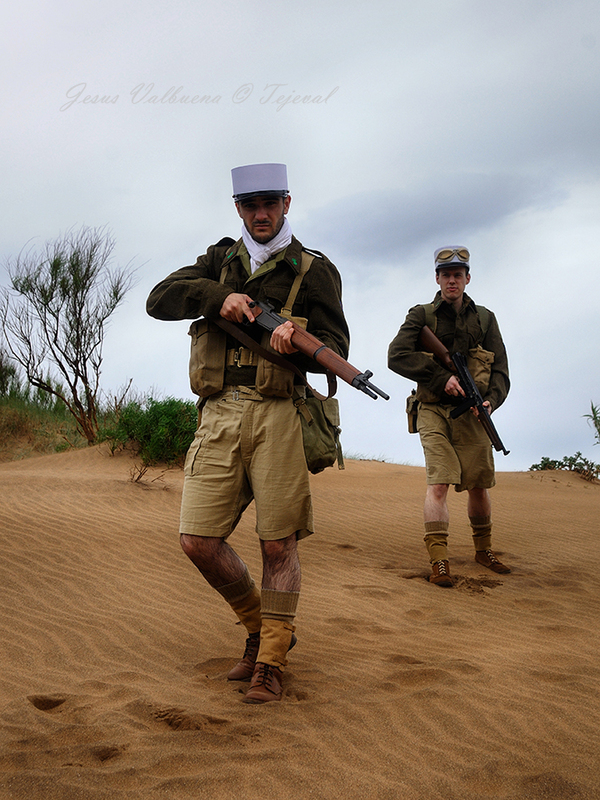 Each of the Foreign Legion battalions were then supported by artillery, anti-tank defence, anti-aircraft guns and a section of trenchers, making it a modern and effective fighting force. 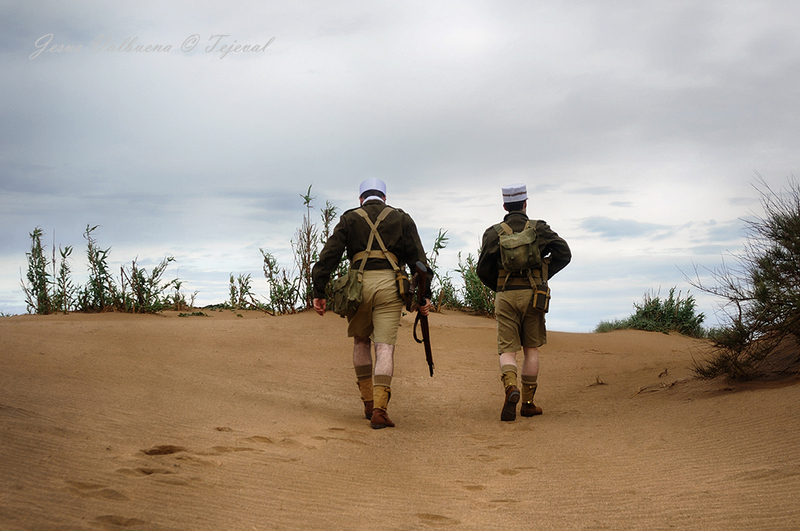 In January 1942, Rommel resumed the offensive and the British saw themselves forced to withdraw south of Bengasi. The French established a defence line at El Gazala, but they could not establish contact with the enemy. On the 14th of February, they relieved the Indian 150th Brigade at Bir Hakeim. Colonel Amilakvari and his men immediately began reinforcing the defence of the position, which was located south of El Gazala, about 65 kilometres from the sea. 957 legionaries (a 30 percent of the 1st BFL force) took part in the battle. They soon organised many 'Jock' columns, supported by strongly armoured vehicles, anti-tank guns and Bren gun carriers suitable to get through minefields and carry out deep reconnaissance missions, a task the legionaries willingly accepted. 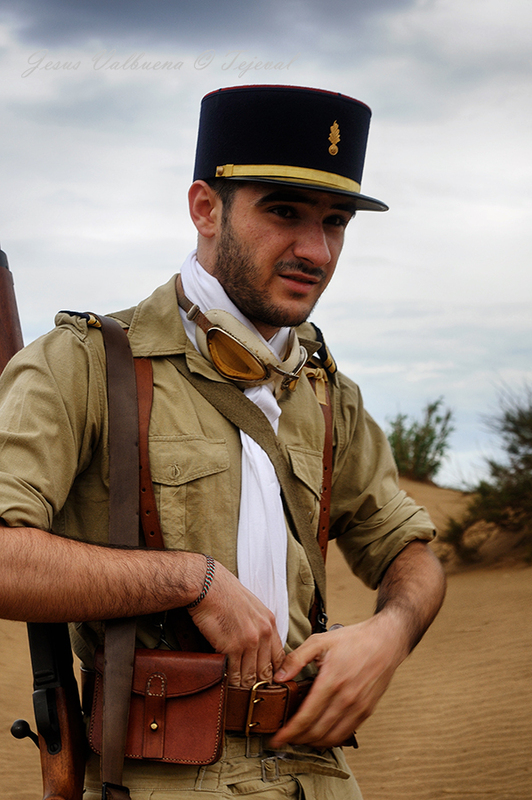 The Axis troops launched their attack on Bir Hakeim on the 27th of May. The Italian 'Ariete' armoured division rallied against the 1st BFK positions and its tanks broke through the defence of the 2nd battalion of the 13th DBLE, but the legionaries recovered and destroyed 19 tanks in an operation where the Spanish Republicans, and especially a Basque -José Luis Artola, who fired his anti-tank gun against the Italian armoured vehicles- played a special role. That first attack was a failure, and soon afterwards they suffered intense air raids carried out by German planes and new offensive attempts. On the 3rd of June, Rommel ordered the defenders to surrender, but the Free French refused; the 90th German Light Infantry Division resumed attacks, but it was also repelled. In the end, it became a hopeless situation and General Koenig ordered the evacuation of the position in the night between the 10th and the 11th of June. The legionaries were given the honour to cover the withdrawal by clearing the way through the minefields with their Bren Carriers. As a result of the battle, the 13th DBLE lost 27.5 % of its men, and many legionaries ended up captured by the enemy. José Artazcoz perished, while Hermenegildo Huarte was taken prisoner and then died on the 17th of August when the boat that was to carry him to the Italian fields was torpedoed by the British. 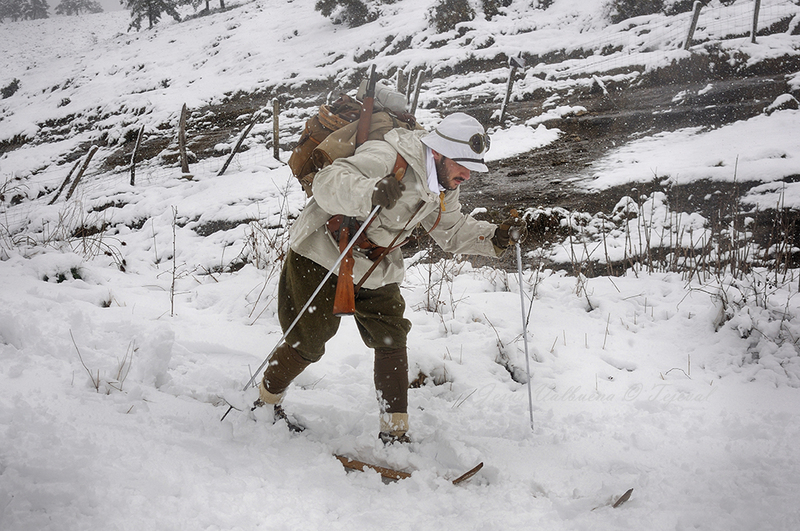 The 2nd and the 3rd battalions of the Legion took part in the battle, while the 1st battalion covered the Gazala line. 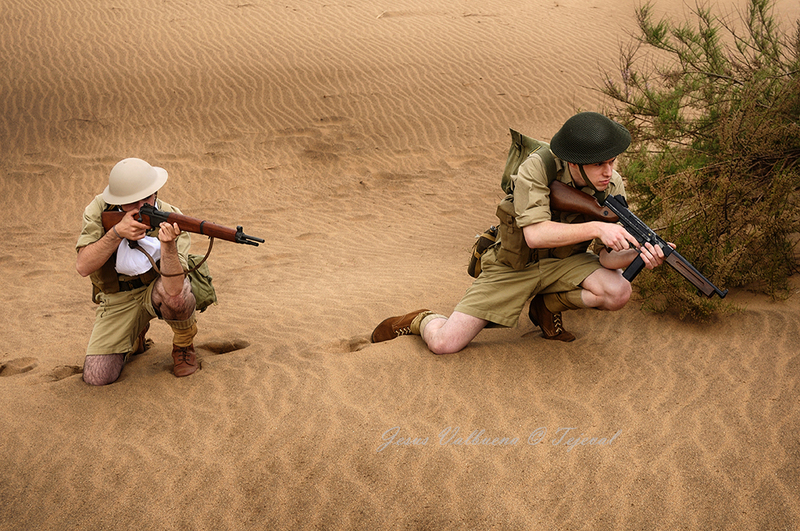 In the second battle of El Alamein, the 13th DBLE was again formed by only two battalions, since the 3rd one was disbanded, but the remaining men formed an anti-tank company. 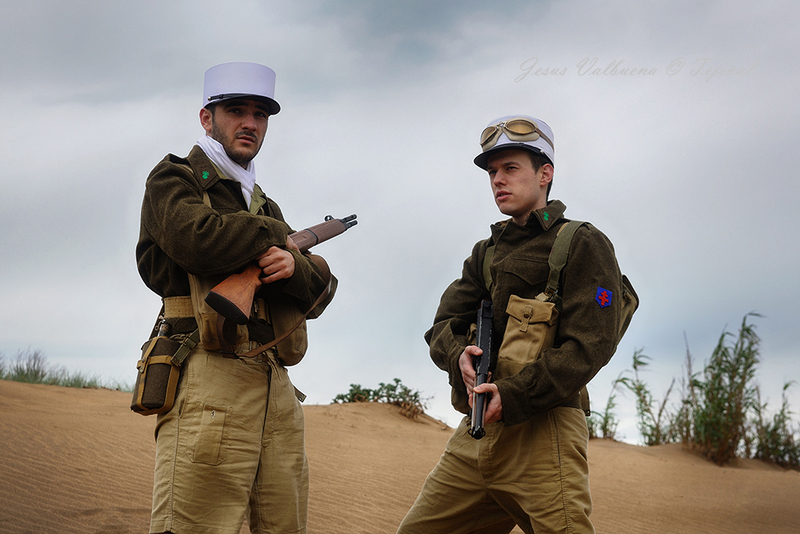 Since the 1st BFL- which provisionally adopted a 'more French' appearance after the occupation of the Vichy arsenals in Syria- had lost a great deal of ammunition and supplies at Bir Hakeim, it had to be fully reequipped by the British: Enfield rifles, FA Bren, mortars, etc. 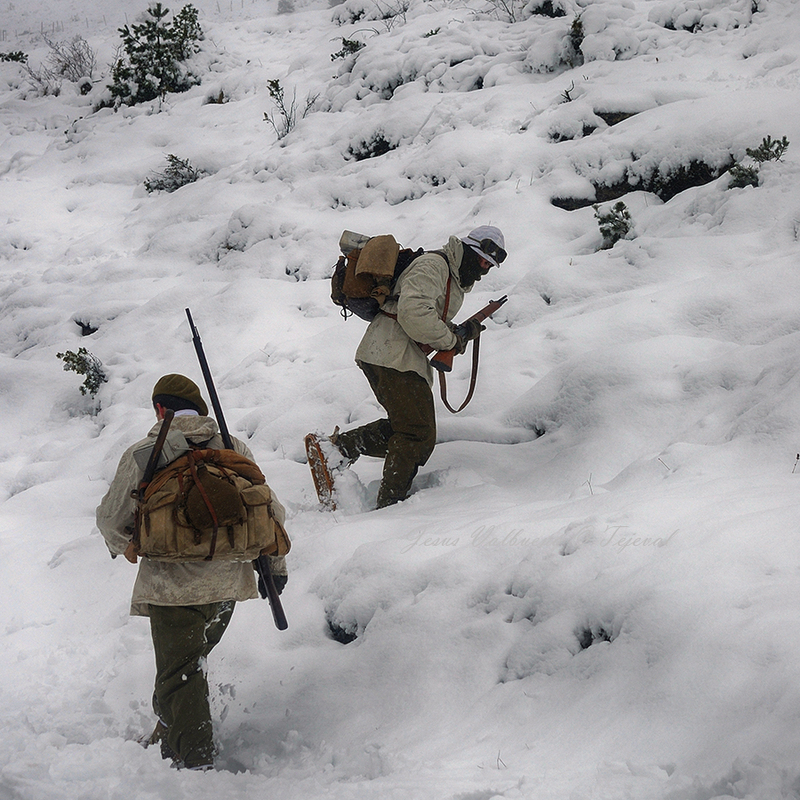 On the 13th of October, they were ordered to occupy the Himeimat ridge, located in the left side of the whole British offensive. The legionaries, after covering the 16 kilometres that separated them from their initial position, would have to face the Italians once more. The 2nd Battalion launched a hard attack against the Folgore Parachute Brigade, but since the defenders of the Himeimat soon received the support of some German armoured tanks, the 13th DBLE, lacking the appropriate artillery to counter-attack them, had to withdraw. 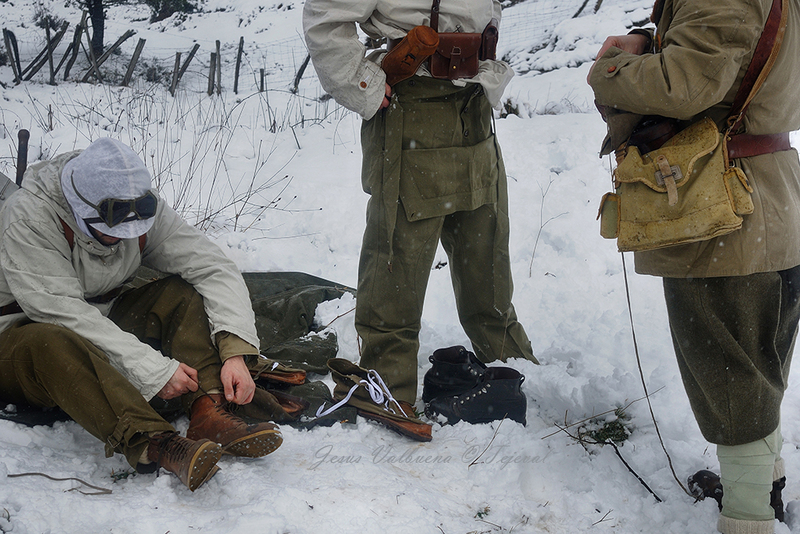 It became a very harsh battle, in which the number of casualties increased by the hour. The legionaries had a terrible time under the severe fire of the German artillery and lost their most charismatic leader: Lieutenant-Colonel Amilakvari. The British called into question the behaviour of the Free French troops due to the defeat at Himeimat and pushed them into the background in the development of the operations at El Alamein. As a result, the 13th DBLE was relegated to second-line missions until April 1943. During that period, the French army displayed on Morocco and Algeria, after briefly opposing the Anglo-American disembarkation in November 1942 and allowing the rearmament of the Axis forces, finally declared itself at war with Germany and Italy and started fighting against them. 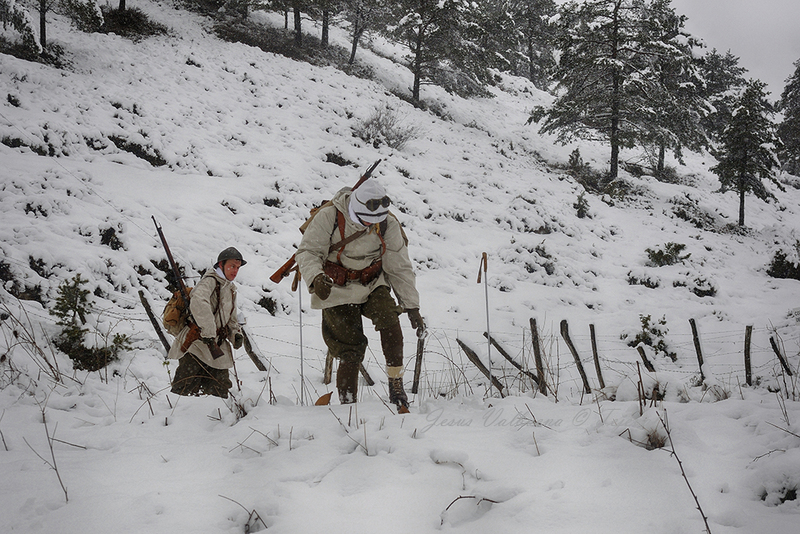 In January 1943, the 3rd Foreign Legion Infantry Regiment, including around fifteen Basques, suffered the first casualties at Djebel Mansour, where Félix Tajada Lapeyra and Rafael Bilbao perished. Although they were condemned to understand each other, trouble soon arose between the old Vichy soldiers and the Free French veterans, whose outstanding figure was General Leclerc, who fought in the Sahara. By the beginning of 1943, Rommel had recovered the offensive in Africa provisionally. He defeated the North Americans at Kasserine pass but, fully aware that he could not hold their advance much longer, saw himself forced to establish a new defence line, becoming trapped between them and the many nationalities under British command that threatened him from the East: British, Australians, South-Africans, New Zealanders, Indians, Polish, Greeks and French. 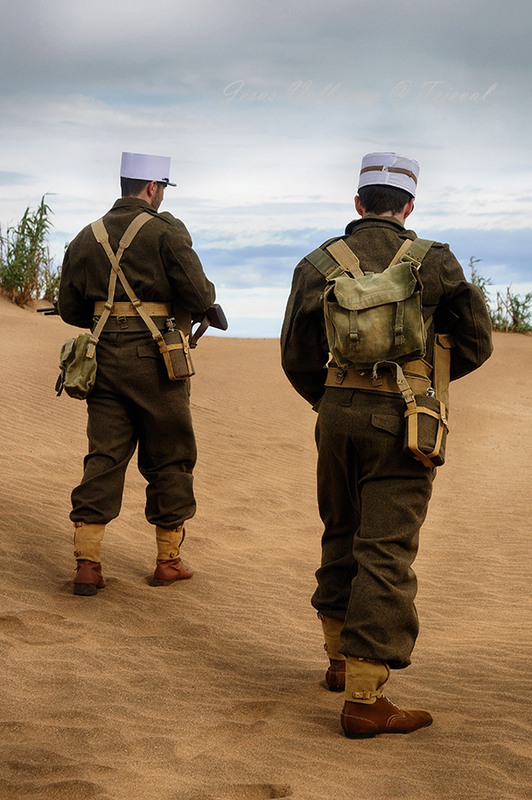 The French soldiers were for the first time joined together in a big unit: the 1st Free French Division. On the 19th of March 1943, General Montgomery's Eight Army launched an offensive against the Mareth line. This was the opportunity the legionaries had been waiting for, now that they were under the wings of the 1st DFL, to leave behind a long, demoralising period of stagnation. On the 30th of April, they crossed the Tunisian border and, in the night between the 6th and the 7th of May, they started relieving the men of the 153rd British Brigade near Djebel Garci, some 15 kilometres West of Enfidaville. Facing them, there were elements from the 90th German Light Division -old acquaintances from the battle fields of Bir Hakeim- and the Trieste Italians. There were several surprise attacks with the enemy at nobody's land followed by exchanges of artillery fire. They lost 3 Bren Carriers and took some prisoners, but the front remained stable until the 11th of May, when there was a harsh battle in which 7 men died, 27 were wounded and 1 was lost. 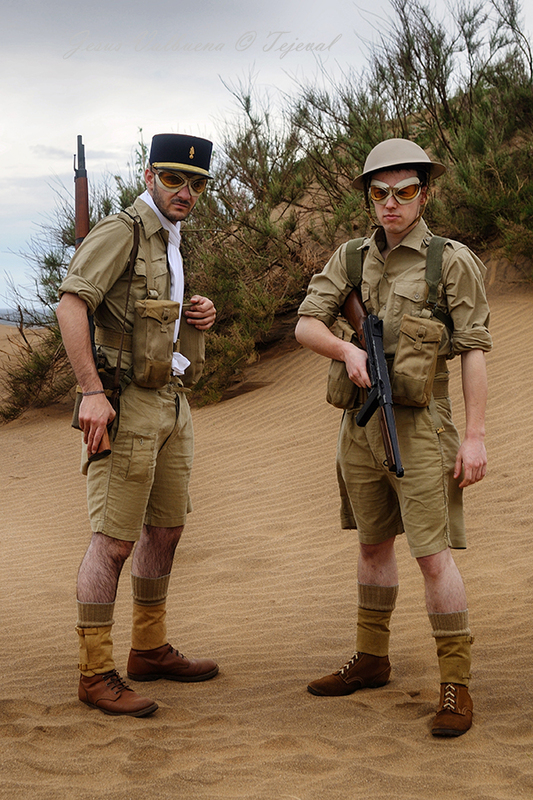 It was the Afrika Korps' swan song. On the 13th of May 1943, 3 years after the Bjerkvik victory, the columns of German soldiers started crossing the French lines to surrender. General Von Arnim had capitulated. 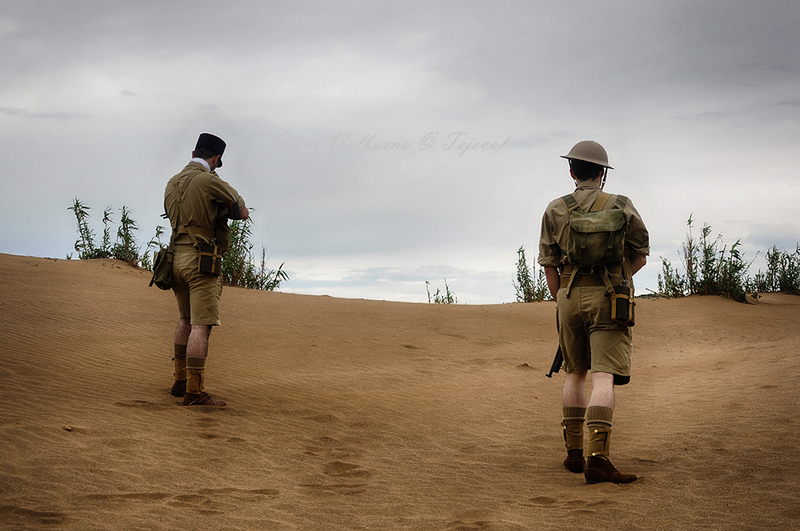 It was the end of the African campaign. 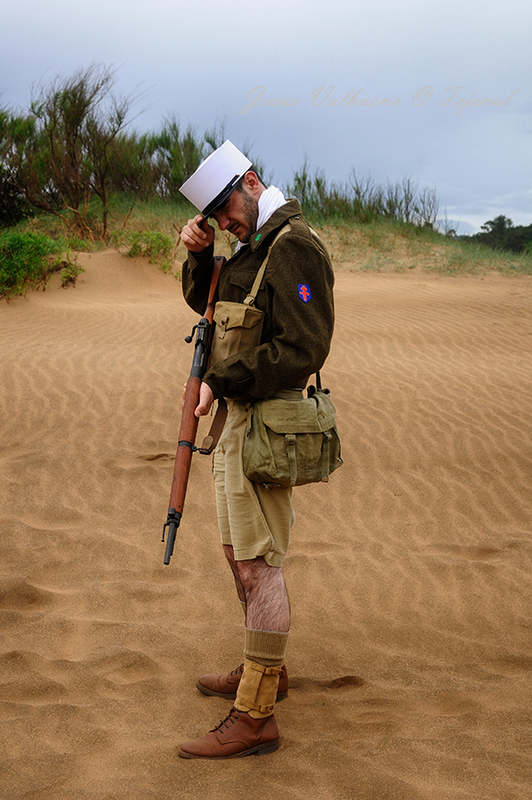 Bir Hakeim, June 1942. 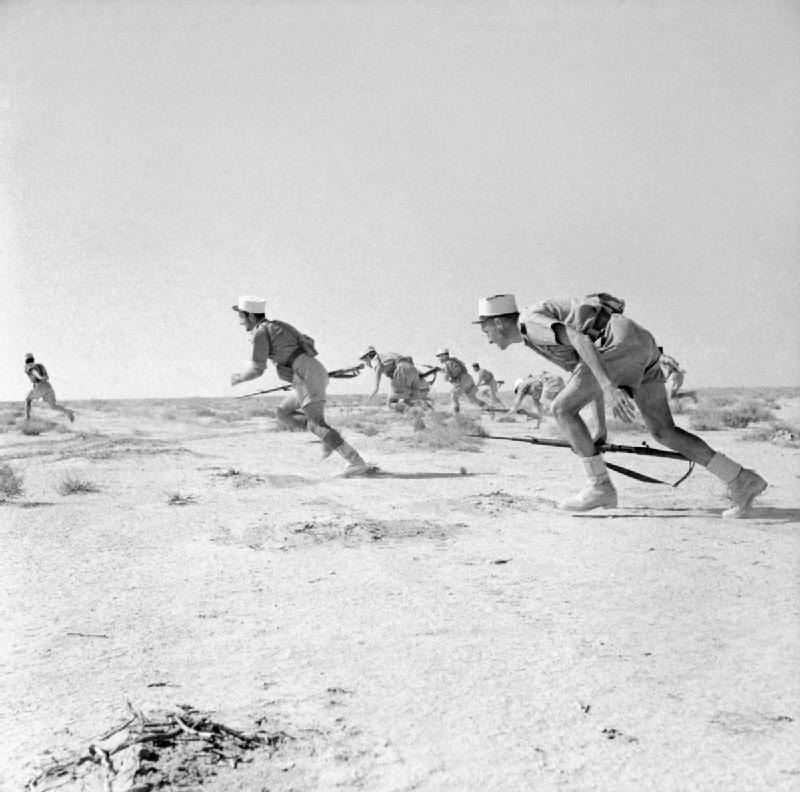 Legionaries of the 13th DBLE charge in the desert in order to take an enemy position (Imperial War Museums). Comor, André Paul, "L'Épopée de la 13e demi-brigade de Légion étrangère, 1940-1945", Nouvelles Éditions Latines, París, 1988. 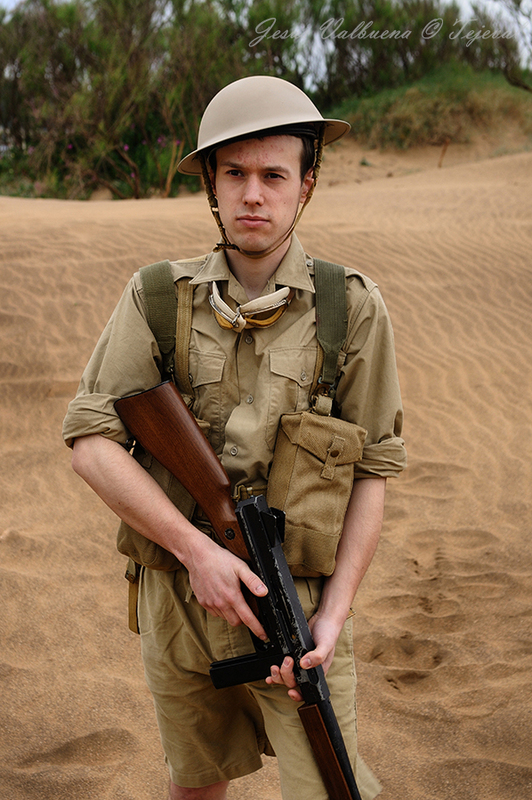 Macksey, K. J., "Africa korps", Historia del siglo de la violencia, campañas, libro nº1. Editorial San Martín, Madrid, 1971. Epílogo de Vicente Talón sobre los españoles que combatieron en África. Pons Prades, Eduardo, "Republicanos españoles en la Segunda Guerra Mundial", La esfera de los libros, Madrid, 2003. 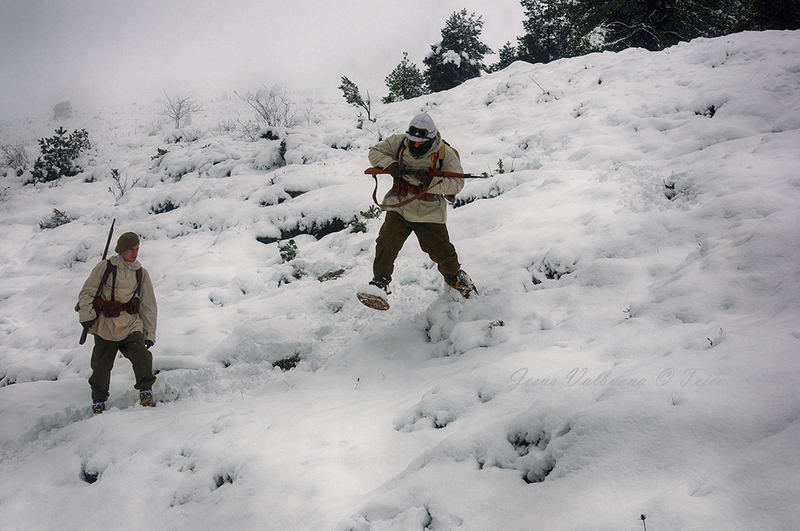 Chueca, Josu, "Gurs, el campo vasco", Txalaparta, 2006. Gaspar Celaya, Diego, "La guerra continua. 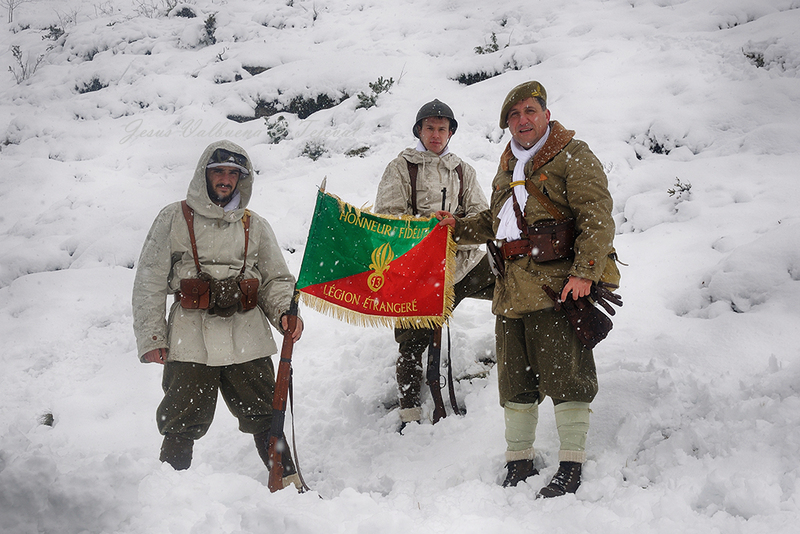 Voluntarios españoles al servicio de la Francia Libre (1940-1945), Marcial Pons, Madrid, 2016. Centro Documental de la Memoria Histórica. Fondo Manuel Irujo, Eusko Ikaskuntza, Sociedad de Estudios Vascos.